This home is currently for sale - see the Dwell Home section for more information. General Contractor: Mt. Vernon Homes, Inc. The Original Dwell Home was the winning design of the Dwell Home Design Invitational. The home was designed by Resolution 4: Architecture, a firm based in New York City. Sixteen architects from the U.S. and abroad were selected to submit design entries to the competition. Since then, the house has been the subject of national press attention and has received accolades from media, designers, and design enthusiasts. 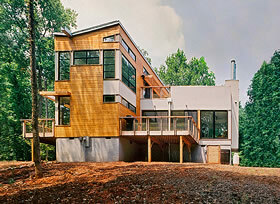 In April 2005 it was called "the most high-profile modern prefab house in America" by the Washington Post. The project is a compelling case study for the marriage of prefabricated construction and cutting edge modern design. In fact, many say it is largely responsible for a resurgence of interest in modern prefab architecture. The magnitude of this interest was manifested when over 2,000 people arrived to view the home during construction in July of 2004. The house was officially completed in April 2005. It was also the first home to be completed by Wieler Construction, LLC. Homeowner Nathan Wieler leveraged the lessons learned in building this home to launch the company's current portfolio of modern prefab home designs. The home sits on a secluded hilltop surrounded by federal preserved lands yet located five minutes from downtown Pittsboro in Chatham County, North Carolina. 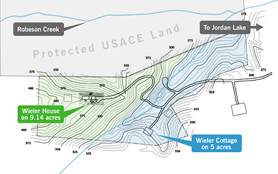 The home is ideally sited to take advantage of views of the surrounding hills and access to thousands of acres of federally preserved Jordan Lake land. The exterior features cedar siding and concrete along with decks made of recycled composite materials. The bright, open interior spaces offer a visual connection to the outdoors, and include sustainable features such as bamboo flooring and passive solar orientation. The house has been featured extensively in the media, with coverage in publications such as the New York Times and Wall Street Journal. Refer to our Press section for past media coverage. Additional information about the history of the house is located on the Wieler Story page, and a gallery of photos is also online.